Little Folks Music - What? Me, Teach Dance? Are you an early childhood professional who teaches and provides daily care to young children? Do you consider yourself a competent and confident teacher? Regardless of your education or experience, do you stop cold in your tracks at the mere mention of the word dance? Fear not! Incorporating dance into your classroom doesn't need to make you grimace. "But," you say, "I don't know how!" "I don't have any rhythm." "I'm much too shy; I'll feel foolish." Trust me, I've heard it all. I'm here to tell you that not only can you introduce dance into your classroom, but you'll also have fun doing it! And, most important, the children will love it! They're born to move. If you can learn to toss aside your inhibitions, get silly, and have fun, your lack of talent will never be missed. Instead, you'll be providing great physical activity and the joy of making music together. 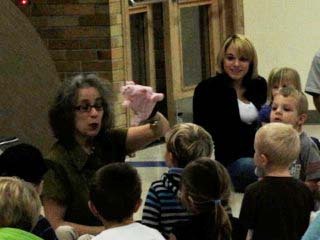 When I began working with toddlers and preschoolers, I found music and movement to be an indispensable teaching tool whether in circle time, during transitions, as a morning greeting, or spontaneously throughout the day. Using a song at clean-up time almost always gets the job done with smiles. And movement songs are great ways to help engage reluctant children. Running outside to experience the weather and reinforcing it with a song and dance provides an opportunity to add movement and enthusiasm to science topics. Children love creating rain, snow, sun, and wind dances. Add scarves and music, and presto-you have a wonderful dance! After naptime, dance is a great way to shake off that slumber and get energized and focused. Parents should be encouraged to participate. I used to organize a monthly sing-and-dance-along. Parents and seniors from near-by retirement communities were invited to sing, dance, and create art with us. We used music and movement to celebrate the seasons, childhood, learning, and life. Becoming musically involved can have a profound effect on everyone. At times when children need energizing, we teachers often need re-energizing. So add a hop to your step and some creativity to your curriculum. Begin with small movement songs. Give children time to explore and add their ideas. Keep verbal directions to a minimum. Stop before children get tired or bored. You don't have to have different music for different age groups, but infants respond well to slower paced music. Children love all types of music. Many of the traditional folk songs can easily be adapted to your classroom. As you know, children have many different learning styles. Some children jump right in, actively imitating the teacher or improvising on their own. Every group also has a few soloist performers. Unless they are too disruptive, always respect their right to approach activities in different ways. Some children have difficulty joining groups. These children tend to keep their distance or sit down while everyone else flutters around. Be careful not to automatically assume that these children are uninterested, and try not to overly coax them to join in. These passive, observant learners often learn as much from activities as everybody else. If they're listening, they're participating. 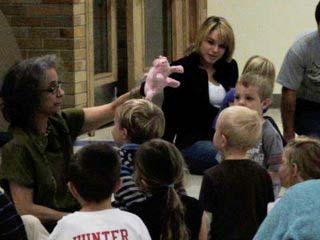 Group time can be overwhelming to some children (and adults). Give children the chance to join in when they're ready. Some children like to learn by themselves and need more space than others. Be encouraging, not pushy. Most classrooms also have a couple of wanderers who like to weave in and out of activities. Again, if they aren't too disruptive and they are listening and watching, try to give them the freedom to participate in ways that are comfortable and enjoyable to them. Lie on the floor with your knees to your chest (don't groan, this is great for your thighs). Then rest an infant on your legs while holding him under his arms. Gently bounce your legs while you sing a happy tune like Humpty Dumpty or Way up High on Apple Tree. On a particular cue, lift your legs to a slight angle and slide the infant down your legs, into a hug. Gently lift an infant up and down as you sing a musical scale. As we all know, toddlers can be a handful. Most toddlers are in their wandering stages. One or two wanderers are amusing, but a room full of them can be overwhelming. You might want to consider working with smaller groups. Or, you can invite parents, retirees, or high school students to participate. Encourage everyone to join in and have fun. 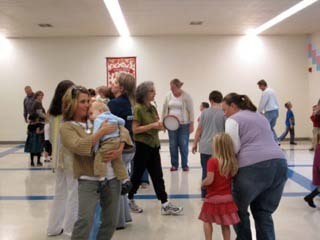 As you tap a drum to a steady beat, walk children around an area until you stop the drum. 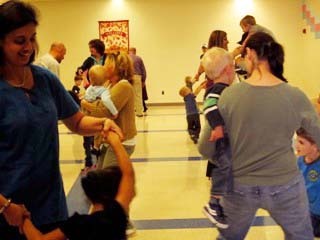 Lead the children by repeating the movements you want them to follow. For example, as you tap the drum sing, let's walk and walk and walk and walk and walk and walk and ready, stop! Have children follow different movements like tiptoeing, running, galloping, and so on. Bring a cassette player into the classroom to play music. When the music starts, lead the children by swinging your arms, tapping your toes, bobbing your head, and shaking your hips. Start and stop the music periodically; every time the music starts, add a new twist, bounce, or turn to get the children moving. Use props. Make streamers out of crepe paper, use scarves or ribbons. The children can hold the props, or you can tie them onto thin wooden dowels for the children to wave around. Show the ways to dance with the props  waving them down low and up high, swaying back and forth, behind your back, and in circles. Make sure you ask children for their suggestions. Choose music from the different cultures represented in your classroom. Follow the leader with music. Give children instruments (homemade ones are great). Lead a parade of musical children around the playground or classroom. Give children the opportunity to lead the parade as well. Grow like flowers and trees. Ask the children to crouch down as far as they can so they become tiny seeds. Using a slide whistle, tell the children to grow into big tall flowers or trees as you whistle. Personal space is a hard concept for most children to grasp. They are not aware of spatial relationships yet. Have you ever noticed that young children have a tendency to sit almost on top of each other when they're in a group? One way to help establish the distinction between personal and general space is to have them stand with their arms extended out to their sides and turn around in a circle while the teacher explains that this is their personal space. It's a special space that gives people room to move around without bumping into people. At this age, many children are ready for more guided movement activities. Transition is another important issue when working with young children. Creative movement and dance activities scheduled in the afternoon can be a huge help with the transition from the classroom to their homes. 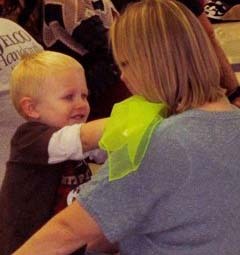 Setting small goodbye rituals involving dance helps children leave with a smile. Most preschoolers will try anything, so have fun! All of the following activities have been given the preschooler's seal of approval. Dancing bodies: Lead a series of fun stretches to get children ready for a new day, become energized after naptime, or relax before the car ride home. Do windmills with your arms, reach for the sky, tickle your toes, twirl like a top, sway like a tree, rock back and forth like a rocking chair. Moving to the beat: Using a drum, set the beat for movement. Direct children to jump backwards, gallop in a zigzag, move using tiny steps, and dance using big steps. Have fun and be creative! Stop and go listening: Have a bell and some music ready, you can use recorded music or a drum. Before they start moving, tell the children to freeze when the music stops and change directions when they hear the bell. Encourage them to walk, tiptoe, slide, gallop, or jump to the beat. Dinosaurs and fairies: Lead the group in a discussion about how dinosaurs and fairies move. Pre-record two types of music, one heavy and dramatic, the other light and airy. As you make your tape, alternate portions of the dramatic song with the light song. Before the children start moving, ask them to identify which one sounds like a dinosaur song and which one sounds like a fairy song. Then have the children move around the room as dinosaurs when they hear the dinosaur music and as fairies when they hear the fairy music. Regardless of age, developmental level, or attention span, all children at one time or another will need a break from the hustle-bustle of group activities. They'll need to rest, relax, and be by themselves. When you notice that several of the children are starting to lose interest, you may want to stop the activity. Times like these are perfect for using calming breathing techniques. This little break can help children re-focus. It usually works like a charm. First, tell the children to take a nice deep breath and hiss like a snake when breathing out. Take another deep breath and growl like a lion. Take a couple more deep breaths while reaching for the sky and exhaling while slowly bending down to touch the floor. Dance and creative movement will add an exciting new element to your day. It's difficult to frown or mope when our bodies are moving to the beat of a drum or swaying to the music. Our bodies need the freedom to move and be creative  and so do our minds. 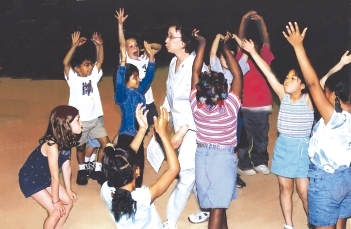 Use these activities as a starting point to develop your own dance and movement program. By providing fun experiences, you are giving children a gift that will last a lifetime: the joy of music and movement. Don't just dance at scheduled times. Be spontaneous. Be creative. Put on those dancing shoes, and dance your way through the day. All children are born with the potential to be musical; nurturing this natural potential will give them a jump-start. For some children, music and movement are their only means of self-expression. Music and movement affects all areas of learning and development, such as social, emotional, physical, cognitive, language, and fine and gross motor. Music and movement provide a consistent opportunity to develop important listening skills. Making music is a joyous experience, and it instills a sense of well-being. Music can soothe a cranky child, relieve stress, burn energy, make transitions smoother, and instantly transform an environment. Infants and children are very responsive to music. Musical activities have a way of bringing people together.